Despite continuing efforts to push medical training to the online sphere, research clearly proves that in-person training with hands-on high-fidelity equipment yields superior outcomes for providers and their patients. Indeed, a strong push by companies across the U.S. has led to more training occurring in front of a computer, and less in front of a teacher. Students in need of an American Heart Association Advanced Cardiovascular Life Support certification find themselves drawn into “online-only” courses that promise certification in as little as an hour at a deceptively low price. Their deceptive marketing claims to use American Heart Association guidelines and provide students a certification that employers will accept. Yet, once students finish their course and receive their certification card, they find the card does not bear the American Heart Association logo or name at all. Further still, no employer that ascribes to excellence in medical training will accept certification by such an unsubstantiated provider. Despite the fraudulent backdrop of online-only providers, their financial success is as great as their false claims. Indeed, online resuscitation training companies boast impressive success, with one claiming to have provided 50,000 certifications – totaling over $7 million in income at their average course cost (ACLS Medical Training, 2016). With the amount of deceiving promises made on their website, their financial success comes as no surprise. Two leading online-only providers – aclsmedicaltraining.com and promedcert.com – make outlandish claims that flagrantly violate AHA standards, such as that students can re-take their certification exam an unlimited amount of times and need not perform any skills assessment (Professional Medical Certifications, 2016). ACLS Medical Training goes as far as to state that “a simulation exercise does not improve students’ knowledge of ACLS more than a lecture. This means that even though the more expensive, high-fidelity BLS simulators are a nice addition to ACLS and PALS certification courses, these devices do not improve learning” (ACLS Medical Training, 2016). To substantiate that claim, they cite an article from the American Journal of Pharmaceutical Education, which, upon close inspection, states, “Test scores improved significantly from baseline in all groups but were highest when lecture was followed by simulation…[A] greater number of students felt more confident with their ACLS skills following the simulation exercise compared with the lecture. Finally, the overall degree of satisfaction was significantly higher with simulation compared with lecture in both crossover groups” (Davis et al., 2013). Even the source cited by the fraudulent providers contradicts their false claims. Simulation of realistic scenarios has long been a staple of high-quality training, yet recent research has shown that technologically advanced training equipment can provide even better results in simulated training. The term “high-fidelity” refers to simulation scenarios that utilize computers or electronic equipment to build a dynamic and responsive training experience. Overwhelmingly, recent research has backed use of high-fidelity equipment as superior to traditional methods. In 2007 a groundbreaking study found that residents trained in ACLS with simulation technology performed ACLS 22% more adherent to standards than those trained without simulation technology (Wayne et al., 2007). Two years later another peer review study compared low-fidelity (standard manikins) versus high-fidelity training simulation and found a 15.2% increase in skill mastery in the high-fidelity group (Rodgers, Securro & Pauley, 2009). These results have also been confirmed in training sites around the world. One study in India showed that Indian students who participated in realistic ACLS simulation performed better than those whose training focused on reading or videos alone (Delasobera et al., 2009). Even though simulation training is proved more effective by research, do students enjoy high-fidelity simulation, or can it be perceived as too intense and demanding? Indeed, simulation can prove challenging and even nerve-wracking to students; one study found that students’ heart rates increased an average of 32 beats/minute when involved in simulated scenarios (DeMaria et al., 2016). Nonetheless, when filling out ACLS course evaluations, students consistently request more hands-on training in their feedback comments. Indeed, high-fidelity hands-on training is both important for and appreciated by ACLS students. Davis, L, Storjohann, T, Spiegel, J, Beiber, K, and Barletta, J. (2013, April 12). 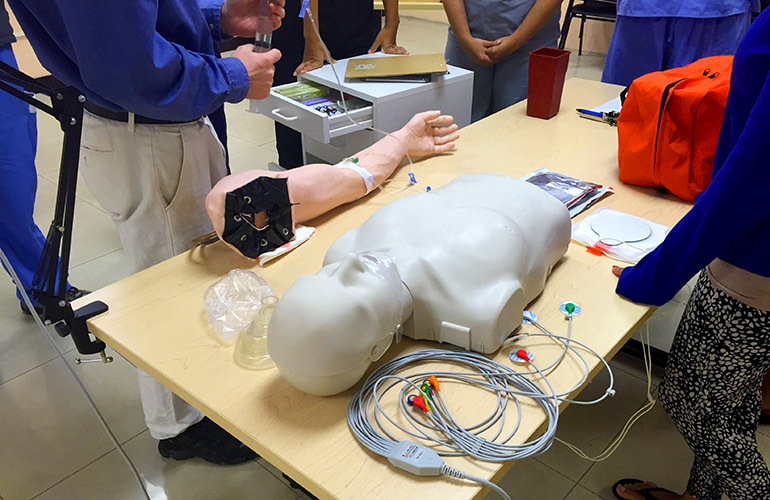 High-fidelity simulation for advanced cardiac life support training. Am J Pharm Educ. Apr 12 2013;77(3):59. Delasobera, B, Goodwin, T, Strehlow, M, Gilbert, G D'Souza, P, Alok, A, Raje, P, Mahadevan, S. (2009, November 18). Evaluating the efficacy of simulators and multimedia for refreshing ACLS skills in India. Resuscitation 2010 Feb; Vol. 81 (2), pp. 217-23. DeMaria, S, Silverman, R, Lapidus, K, Williams, C, Spivack, J, Levine A, Goldberg, A. (2016, April 7). The impact of simulated patient death on medical students' stress response and learning of ACLS. The impact of simulated patient death on medical students' stress response and learning of ACLS. Medical Teacher 2016 Jul; Vol. 38 (7), pp. 730-7. Rodgers, D, Securro, S, Pauley R. (2009). The effect of high-fidelity simulation on educational outcomes in an advanced cardiovascular life support course. Simulation In Healthcare: Journal Of The Society For Simulation In Healthcare 2009 Winter; Vol. 4 (4), pp. 200-6. Wayne, D, Didwania, A, Feinglass, J, Fudala, M, Barsuk, J, McGaghie, W. (2007, June 15). Simulation-based education improves quality of care during cardiac arrest team responses at an academic teaching hospital: a case-control study. Chest 2008 Jan; Vol. 133 (1), pp. 56-61. At St. Louis Heart Training we believe active medical practice should be supported by a foundation of rigorous research in medicine and health care practice. Our staff engages in regular investigation of trending issues in medicine and provides research-backed opinion articles to enrich your medical tastes.